As we all sit here politely waiting for the beer bubble to burst, for the market to reach saturation, for the irrational exuberance to subside, more and more breweries keep opening across Washington. We recently breezed past the number 400 like it was no big deal and I’m already accustomed to saying that Washington is home to over 400 breweries. Well, you can add two more to the list: Crane’s Castle Brewing in Bremerton and Black Fleet Brewing Taproom and Kitchen in Tacoma. Crane’s Castle Brewing opens this weekend, with plans have a grand opening celebration in a couple weeks. Dan and Megan Kranenburg, the owners/operators at Crane’s Castle, are proud Kitsap residents and veterans of the U.S. Air Force, though they want to make it clear that Bremerton’s many naval personnel and veterans are heartily welcomed. FYI, translated from German, Kranenburg means “The Crane’s Castle.” The beer-only taproom is family friendly. It is located at 1550 NE Riddell Rd, Bremerton, WA 98310. 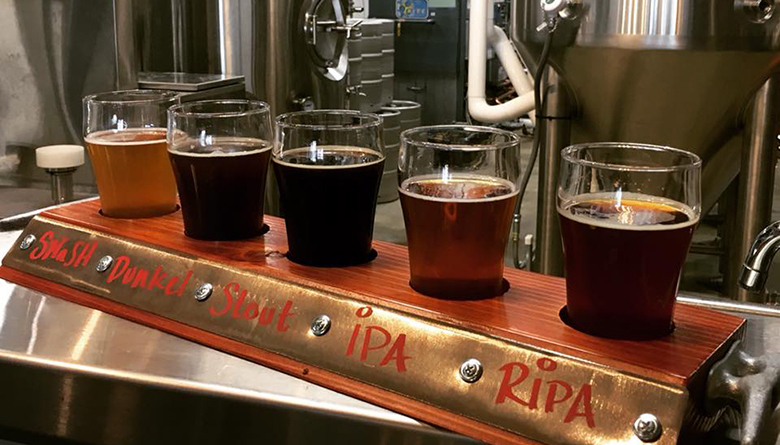 In downtown Tacoma, Black Fleet Brewing Taproom and Kitchen is now open serving beer and food on Fawcett Avenue. Recently, they opened softly with limited operations but have now announced regular hours. They welcome kids up until 9:00. The brewery is named after a fleet of warships operated by a woman in the 14th century — Jeanne de Clisson, a spurned princess who became a fierce privateer known for her nautical prowess in the English Channel. Hers is quite an amazing story. She painted her warships black and adorned them with red sails, which is kind of badass. The Black Fleet’s flagship was named My Revenge. Anyway, back to the brewery. Kyle Maxwell and Caitlyn Byce operate the brewery and eatery, which is housed in a 10,000 square-foot, two story building built into the hillside. The beer comes from a 10-barrel brewing system. The food menu promises to expand as business gets rolling. Black Fleet Brewing Taproom and Kitchen is located at 2302 Fawcett Avenue, Tacoma, WA 98402.